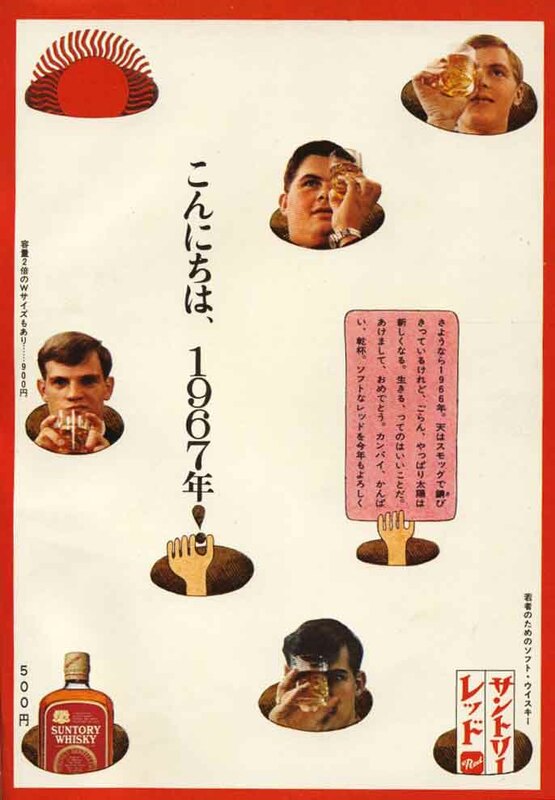 These two ads from an old Suntory Red blended whisky campaign (found here) are new to me. Love the look. The ad above seemed to be aimed at the younger generation, but would perhaps not be possible nowadays, in these politically correct, health conscious times. 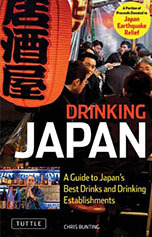 The text on the tap just says "Suntory Red,"and the text between the bottle and the drinking man says: "All those youngsters who can drink water should be able to drink Red." 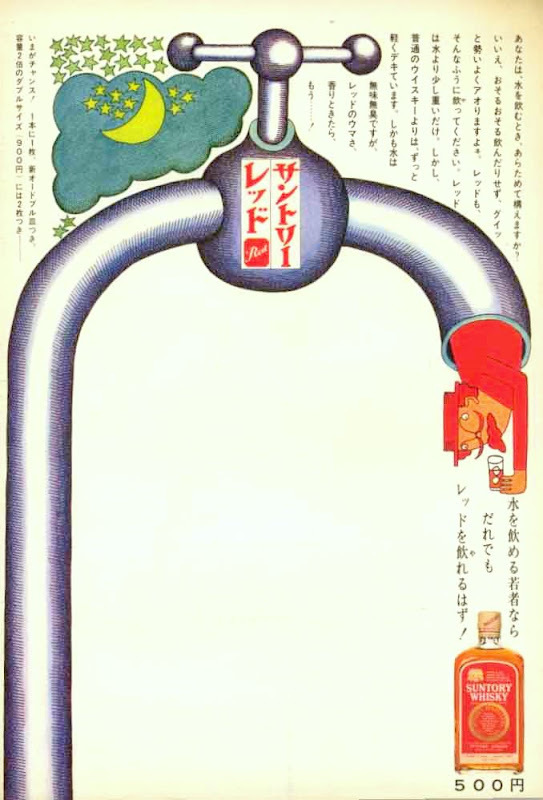 The body text at the top right says: "Do you prepare yourself before drinking water. No you are not scared. You drink it in one swig. Take you red in like that! Red is just a little bit heavier than water but much much lighter than your usual whisky. Furthermore, water is tasteless, while Red's taste and flavour... Oh!" This ad is also aiming at the same younger generation. 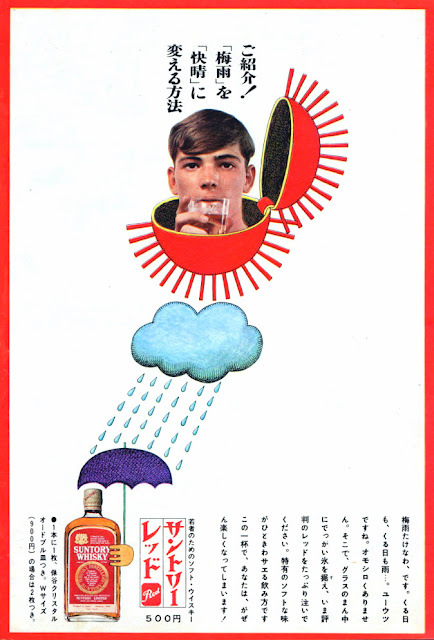 The top text says: "Announcing a brand new method to change the rainy season into sun!" The body text at bottom right says: "In the middle of the rainy season, the rain comes day after day. How depressing! How boring! Please put a massive block of ice in the middle of your glass and pour an ample amount of Red, which is currently in fashion. This way you will taste its original soft flavour most acutely. This one glass will make you very happy.". 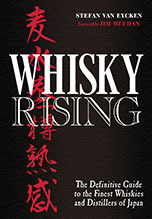 Soft whisky for young people, Suntory Red." Bottom, done during the rainy season. "We will introduce you a method to change rainy into sunny." Bye Bye 1966! The sky is rusty with smog, but look the sun is renewed again.It wonderful. Happy new year. Cheers cheers cheers. Keep care of soft red this year again. Wonderful, very dada. Thanks Chris.